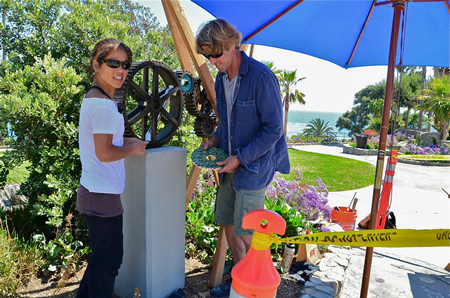 With Heisler Park’s amphitheater as their setting, Scott and Naomi Schoenherr last week assembled their public art installation, “Time Connected.” Taking as its theme nature’s own time clock, the work’s cogs and wheels takes inspiration from lunar and tidal cycles and embellishments from handmade ceramics representative of the native marine environment. For the 46th year, the Laguna Beach Beautification Council used its love of beauty to honor outstanding examples in town of creative outdoor beauty. Award criteria included “curbside appeal” in keeping with Laguna’s culture. Commercial businesses, city commissioned art projects and homes were honored with certificates of merit and a presentation during an awards presentation last Tuesday, June 17, at Laguna Art Museum. Council Vice Chairwoman Eleanor Henry wrapped up the event with a pictorial lesson on good and bad tree trimming. The 2014 commercial winners are: Parc Monaco Building; 31742 S. Coast Highway LLC (Ed Lohrback); Artiques (Paul and Julie Page); Bluebird Farms (Scott Tenney and Mariella Simon-Tenney); Seven-Degrees; Ann Earhart; “Colors of the Canyon” by Marsh Scott, “Mermaid Street Murals” by Jesse Bartels, Phillip Powers, Jill Cooper and Mike Tauber; “Time Connected,” ”Continuous Rotation,” and “Tidal Pull” by Scott and Naomi Schoenherr. 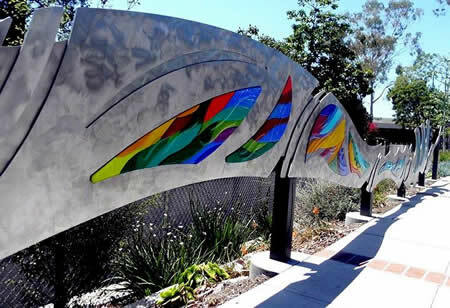 Marsh Scott’s “Colors of the Canyon” public art commission earned a Beautification Council Award. Residential winners are Elaine and Adrian Kuyper, Jessica Dunne, Lester J. Savit, Paulette Adams, Susan Graham-Sparks and Richard Sparks, Scott Wright, Charles and Pat Vining, Taybi Ramin, Steve C. Howard, Donald and Leyla Dennis, John Martelli, Ernesto and Socorro Vasquez, Stacy L. Rollings, #990 Gaviota LLC and Tresor Investments. The council’s original 1952 members included Harry Lawrence (“Mr. Laguna”), Louise DuSoe, Nita Carmen, Fred Lang, Dr. Berryman Green and Harry Willats. “Our mission is to maintain and enhance the natural beauty and cleanliness of all areas within Laguna Beach, encouraging and promoting beautification projects pertaining to streets, parks, the shoreline, residential and commercial buildings,” said board President Ruben Flores. Who Needs a Voter’s Guide?